Visiting Korea for the first time can be daunting—we hope these tips can get you started in the right direction! While Korea has more than 4,000 years of history, it remained closed to the West until the late 1800s. Today, even though Seoul is a bustling cosmopolitan city of ten million, Korea does not see the volume of Western tourists that other Asian countries do. If you venture outside of Seoul into smaller cities or the countryside, you will find less English spoken. 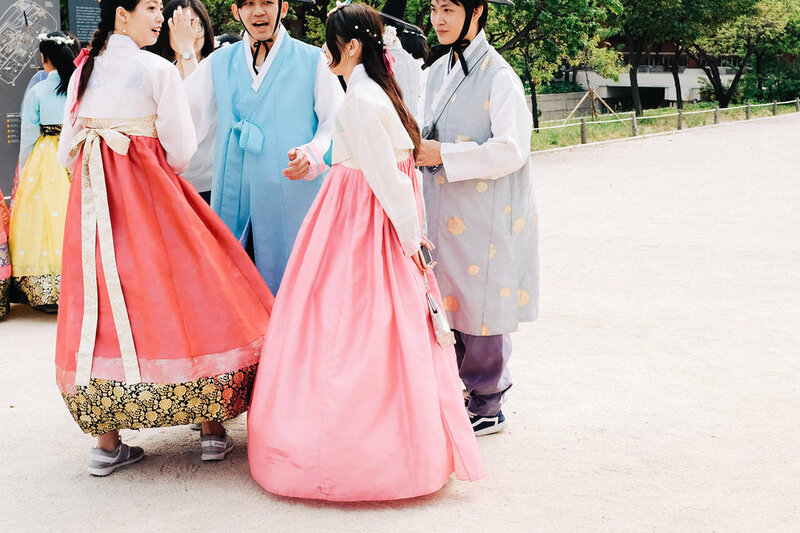 And Korean culture has unique aspects of its own, highly influenced by Confucian tradition, including many patrilineal customs that remain today. More Korean people have a sensibility around adoption and adoptees than they did even twenty years ago, but you'll find in traveling around Korea that you may need to tell your life story from time to time. At the same time, if you navigate silently through the streets of Seoul or beyond, you may find you will be blissfully unnoticed, perhaps for the first time in your life, as many adoptees have grown up in communities where they were a racial minority. Korea is full of surprises and experiences—we encourage you to plan a trip or join one of our Mosaic Tours. You'll need a valid passport from your country of origin. For most countries, the passport must be valid for at least three months after the dates of travel. Most flights to Seoul will fly into Incheon International Airport, about an hour's drive from the heart of Seoul. Buses, subway trains, and taxis are all readily available! A taxi from the airport to Seoul should cost around 60,000 won. Don't worry about connectivity! WiFi is readily available in Korea, and many visitors rent small WiFi eggs as they leave the airport. These eggs connect to the LTE network in Korea, and ensure you have WiFi wherever you go. Many U.S. carriers (AT&T, Verizon, etc.) offer international data plans that you can also use in Korea. See our Staying Connected section, below. Our tours take place in summer, when it can be very hot and humid. Pack lightweight, breathable clothing. Even if you're used to a warm climate in the summertime, many first time travelers to Korea are surprised at how humid it can be. "In most restaurants, you need to buy food even if you only want to have a drink." "Get glasses or sunglasses while you're there. They fit our Korean faces [well], and glasses are ready in 1-3 hours!" "Keep your eyes and ears alert when crossing the street, because pedestrians do not have the right of way." "Don't take the black cabs; they overcharge." "Speak quietly or not at all on the subways and trains." "There aren’t many trash cans. [Be prepared to] hold on to trash until you can throw it out." Before you leave, be sure to call your banks or credit card companies and let them know you will be traveling internationally, to avoid any accidental holds placed on your cards. If you arrive on a Friday, we recommend getting some cash at an airport ATM or exchanging money at the airport, as banks are closed on weekends. For all other arrival days, it is also a good idea to get some money at the airport. You can either exchange money at the money exchange or you can withdraw from ATMs once you are in Korea. Depending on your bank, withdrawing from the ATM is usually best as it gives you the best exchange rate with only a small fee for using a bank that isn’t your home bank. Most credit cards are accepted at most shops, large restaurants, and taxis. However, many stores and restaurants may have trouble processing foreign cards, so make sure that you have enough cash on hand for your purchase. Don't forget to carry a backup card with you, just in case. WiFi is available in most places throughout Seoul. If you have a smartphone or smart device, be sure to download any apps you know you'll want before you arrive in Seoul, just in case. We recommend downloading the KakaoTalk app (iPhone | Android), as is this is the most common messaging app in Korea (some hotels even have KakaoTalk accounts, allowing you to easily message with their front desk or concierge team when you’re on the go!). You'll find hotels in Seoul, Paju, and Pohang all have free access to WiFi. If you want to have your own WiFi device or phone, the easiest way to do so is with a WiFi egg. Several companies rent these small, portable hotspots; we recommend reserving one for pickup online before you travel to guarantee WiFi egg availability while in Korea. You can arrange to pick up your reserved WiFi egg as you leave the airport baggage claim area. While you can always rent one from a store you find in Seoul, in busy months, many stores will not have any available to rent. KT → WiFi hotspot data rate 4,400 won/day; unlimited data on up to three devices. SKT → WiFi hotspot data rate 5,000 won/day; unlimited data on up to three devices. WifiDosirak → WiFi hostspot data rate: 4,500 won/day and then 2,250 won/day after the sixth day. Most laptop chargers and smartphone chargers support power specs ranging within 100v-240v. If your chargers support power within these spectrums, all you need is the small outlet converter, converting 110V (US) to 220V (Korean). This converter can be easily (and cheaply!) bought at convenience stores in Korea, or you can purchase one beforehand on Amazon. For appliances like travel steamers, curling irons, or flat irons, be sure that your appliance has dual-voltage. This will ensure it runs the proper current when plugged into an outlet in Korea (and not burn out!). If your appliance has dual voltage, you only need a converter so that the plug properly fits into the wall socket. If you are charging a lot of small items such as your phone, digital camera, and WiFi egg, we recommend a USB plug like this, which comes with a plug converter and can charge many devices at once, all from one spot! If you have been accepted into the Mosaic Tour or Mosaic Hapa Tour, check out our Tour Members Area! More in-depth information about what to expect when traveling in Korea will be posted there prior to your trip.